Furuno is introducing the second in the series of new generation river radios that it launched last year with the release of the FR1908VBB, a 4 kW Black Box Radar with a portrait display (vertical screen orientation) that allows mariners to see more detail ahead of the vessel. Now, Furuno is adding the higher-powered FR1918VBB to its river radar line up. With a 12 kW output and all of the same features and functionality of its “little brother,” the FR1918VBB will enhance the situational awareness of any river vessel. Navigating inland rivers presents a unique set of challenges, requiring tools that will enhance the navigator’s ability to do the job safely and efficiently. The FR1918VBB Radar uses a custom river mode with an ultra-short pulse length that provides navigators with superior bank, buoy and vessel detection. The radar’s ten preset towing configurations, custom icons, and ability to show distance measurements in inland units further enhance its capabilities. The radar’s range rings are measured in the standard river units of statute miles, and barge icons can be displayed with length and width measurements in feet, and rudder position can also be displayed on-screen. The FR1918VBB is a natural fit with Furuno’s MU190V 19” marine-grade portrait display, but an “off-the-shelf” portrait display can also be utilized. The processor outputs dual video signals in high resolution (1280 x 1024). The radar’s 12 kW output power along with Furuno’s superior target detection ensure that the user will see every target on the river. Six NMEA input/output ports ease interfacing with other electronics and a direct connection to a VDR or SVDR is also available to further simplify installation. Dual SD card slots allow for the capture of screenshots, and can also be used for system configuration backup and restoration. The radar’s black box processor provides a simple one-plug connection to one of Furuno’s high-accuracy satellite compass offerings to provide real-time rate of turn, position, course/speed, and three-axis speed information, providing high precision data for towing and docking maneuvers. 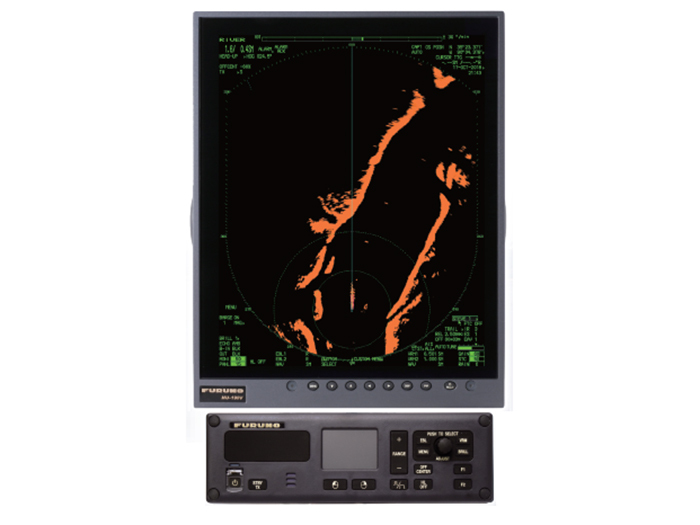 The radar can be controlled from its included slim-design controller with integral touchpad. An optional trackball controller can be added from which the entire system can be operated. The FR19x8VBB series is available in both 4 kW and 12k W open array versions, both utilizing Furuno’s proven, commercial-grade gearbox and a choice of either 6.5’ or 8’ antennas.